We’ve now completed six days of riding south east from Auckland via the East Cape down towards Wellington, a total of 616km. The cycling has been hard but spectacular. 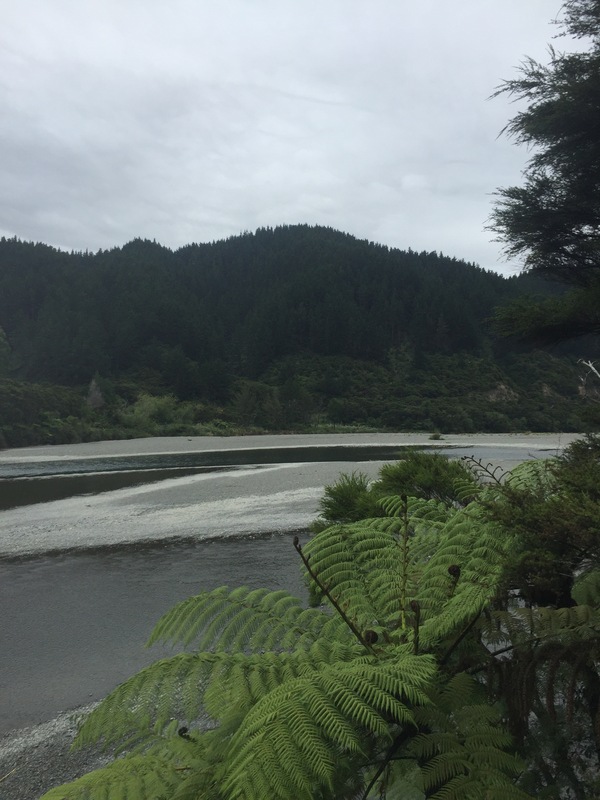 Today we rode from Hicks Bay to Tokomaru Bay climbing inland across wide river inlets, grey pebbled with clear waters up into cattle and forestry country, brightly lit in summer sunshine. The roadsides are filled with the colour and scent of wild flowers – acanthus, cow parsley, corn flowers, fennel and honey suckle. The land feels pristine and largely unspoilt, particularly along the coastline of the Bay of Plenty, where the big silver-grey sandy beaches are filled with the bleached bones of drift wood. It still feels very new to be here and we are still novices in everything. As we cycled yesterday a man on horse back holding his grandson galloped down the middle of the road towards us, wearing wellington boots and staring fiercely inland as if searching for someone. He passed us oblivious to the fact that we’d had to move out of the horse’s way. Long stretches of road have no signs of human intervention and there is little road traffic. We carry plenty of water and food as often the places named on the map are no more than a small gathering of houses, utilitarian and single storey buildings with verandas and yards full of decaying vehicles. Many use old microwave ovens as their post boxes at the end of their drives. This seemed to speak of an ingenious reuse of discarded objects. I like it here and we’re looking forward to seeing and learning more of the country.